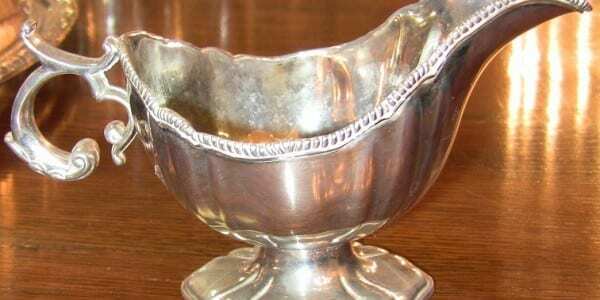 British Silver Plate Gravy Boat. 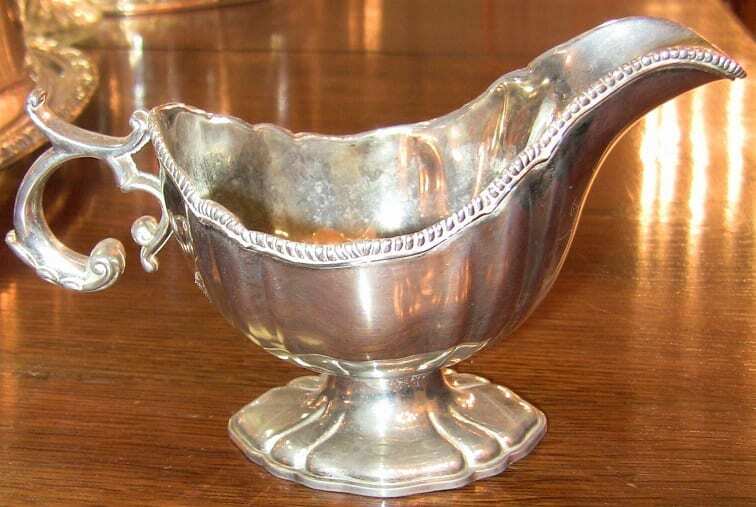 Nice early 20th Century…..British Plate Silver Gravy Boat……unmarked. Nice Simple form……not overly ‘fussy’ !! OLD SHEFFIELD PLATE: Sheffield plate is a layered combination of silver and copper that was used for many years to produce a wide range of household articles. These included buttons, caddy spoons, fish slices, serving utensils, candlesticks and other lighting devices, coffee and tea sets, serving dishes and trays, tankards and pitchers, and larger items such as soup tureens and hot-water urns. Almost every article made in sterling silver was also crafted by Sheffield makers, who used this manufacturing process to produce nearly identical wares at far less cost. The material was accidentally invented by Thomas Boulsover, of Sheffield's Cutlers Company, in 1743. While trying to repair the handle of a customer's decorative knife, he heated it too much and the silver started to melt. When he examined the damaged handle, he noticed that the silver and copper had fused together very strongly. Experiments showed that the two metals behaved as one when he tried to reshape them, even though he could clearly see two different layers. Boulsover set up in business, funded by Strelley Pegge of Beauchief, and carried out further experiments in which he put a thin sheet of silver on a thick ingot of copper and heated the two together to fuse them. When the composite block was hammered or rolled to make it thinner, the two metals were reduced in thickness at similar rates. Using this method, Boulsover was able to make sheets of metal which had a thin layer of silver on the top surface and a thick layer of copper underneath. When this new material was used to make buttons, they looked and behaved like silver buttons but were a fraction of the cost. The "double sandwich" form of Sheffield plate was developed around 1770. Used for pieces such as bowls and mugs that had a visible interior, it consisted of a sheet of silver each side of a piece of copper; early manufacturers applied a film of solder over the bare edge of copper although such pieces are very rare. Edges of early salvers were hidden by folding them over but from about 1790, borders were applied with U-shaped lengths of silver wire to conceal the copper which can often be felt as a lip on the underside. Towards the end of the period, solid wire was sometimes used which can be hard to see. Following the invention of German silver (60% copper, 20% nickel and 20% zinc), around 1820, it was found that this new material also fused well with sheet silver and provided a suitable base metal for the Sheffield process. Because of its nearly silver color, German silver also revealed less wear, or "bleeding", when Sheffield-made articles were subject to daily use and polishing. Being much harder than copper, it was used from the mid-1830s but only for articles such as trays or cylindrical items that didn't require complex shaping. Provenance: Bought at an Estate Sale in Ireland.